YUM! I love a good risotto recipe! This sounds so delicious and the flowers make for such pretty presentation! Klausbernd and I made our first risotto earlier this year and now we love it, thank you for this recipe, Francesca. Hope you are all having a great holiday back home. Thank you so much, dear Antonia! Love your recipe — I’ve had a tomato-rissotto I thought was quite good, but this sounds so much yummier. And tomato season is approaching! You stated your opinion very eloquently — it’s a sad situation, that people behave hatefully toward others, simply because they hold opposing opinions/beliefs. On the other hand, I understand why people, who believe homosexuality is a sin, would feel that a decision to make it legal will have dire consequences. But, they forget, the Bible defines all of the following as “sin” — impure thoughts, hostility, quarreling, jealousy, outbursts of anger, selfish ambition, and ‘the feeling that everyone is wrong except those in your own little group.’ And it also says, that only those who are without sin of any kind should attempt to punish or denounce anyone else. And, it also says, that anyone who says he is without sin, is a liar (therefore a sinner!). I know my Bible — and I know that those who behave in a hostile manner toward homosexuals are as bad as the people they denounce. We’re supposed to all just love one another–be kind, generous, and forgiving. Right? I hope you’re having a great July. I’m late to the celebration party but may I first say: gorgeous gorgeous photography! So cheerfully bold and striking and … HAPPY! I’m also partial your recipe dear Flora. Great post! I am raised to believe, and practice, ‘elimination of prejudices of all kinds’. These photos are the most beautiful ‘red, white and blue’ I have seen. A very well written post! And a lovely risotto! A lovely dish to help celebrate such a momentous occasion! 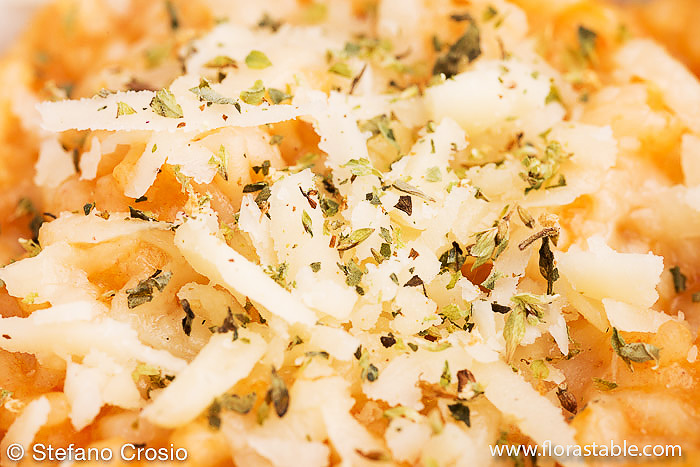 I love the thought of provolone in a risotto — sounds like a great combo with the tomatoes. We are just starting to see some tomatoes at the Farmers Markets. Mostly just cherry tomatoes, but the big ones can’t be far behind. I’ll be keeping this in mind! That’s so very nice of you, Linda! Thank you! Yes, although Ireland is a country of Catholic tradition, it has been civilized enough to recognize that all human beings have the same basic rights! Ireland 1 – Italy 0! Hope your renovations are over – looking forward to seeing the pictures – and that you are having a great summer! Thank you, Sandra. Unfortunately, Italy shares your government’s opinion and I think we are still very far from getting any closer to the U.S. ruling. However, hope is always the last to die! Thank you so much! Awfully nice of you! 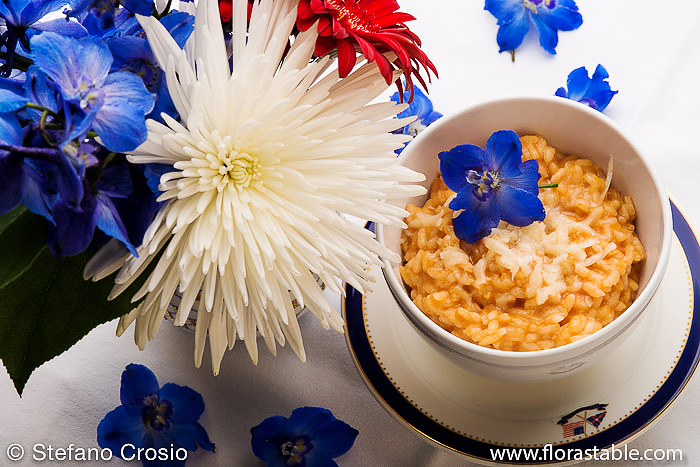 Wonderful Francesca – the risotto looks awesome! Have a wonderful weekend!! A good risotto is always welcome at our home, and this one even more so since tomatoes are another favorite of ours! No wonder you were offered some flowers! Happy holiday to you in the States, the judgement being another tremendously good reason to celebrate. What a beautiful heartfelt post Francesca, The Supreme Court decision is a cause for celebration, a shame it took so long and when I think of those that were treated unequally for all those years it is very sad. Sadly there are still some states that are not accepting this and defying the decision. Now for that risotto, love it, my Mom used to make a tomato risotto and it was one of my favorites, I have saved this, just bought some arborio rice and I will be making it this week. You, Stefano, Her Highness and Sophia have a wonderful holiday!! What a beautiful tribute to this country we call home. Thank you Francesca and the risotto looks super delicious. Thank you, Gerlinde! So very kind of you to comment my post. I love risotto and enjoy making it with many different ingredients. I have to say that the provolone never occurred to me. I must give it a try. I also like your approach to a “simple” tomato sauce. 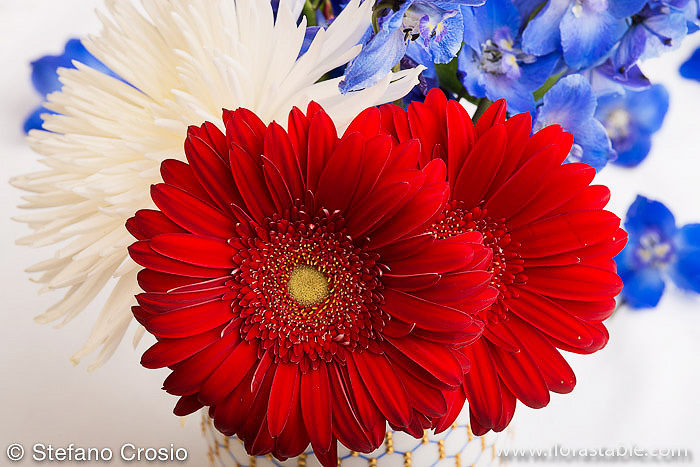 Welcome to the USA and Happy Independence Day to you, Stefano and Her Majesty! Thank you so much, Richard! We feel very blessed to live in this wonderful country! Glad you like the provolone suggestion. Let me know what you think!